Data integration (DI) may be an old technology, but it is far from extinct. Today, rather than being done on a batch basis with internal data, DI has evolved to a point where it needs to be implicit in everyday business operations. Big data – from vast sources and varieties – joins with the rapid growth of emerging technologies to extend beyond the reach of traditional data management software. To stay relevant, data integration needs to work with both indigenous and exogenous sources while operating at different latencies, from real time to streaming. 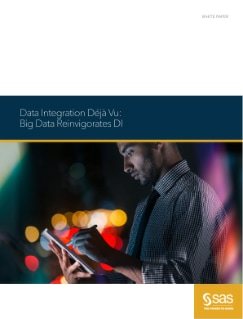 This paper examines how data integration has gotten to this point, how it’s continuing to evolve and how SAS can help organizations keep their approach to DI current.